The Specialist Training Committee (STC) met last Friday and I attended on your behalf. Here is some feedback regarding the meeting along with some important dates for your calendars. I apologise for the length of this message but it contains important information. i. You will not attend in person. The panel will instead just review your e-portfolio and your submitted documentation. “If it isn’t on your portfolio, it did not happen”, be warned! ii. The final day on which you will be able to submit documentation and upload to your portfolio will be Friday 9th June 2017, put this in the diary now. iii. On Friday 30th June 2017 PYAs will take place. Unlike the E-ARCP, trainees in their penultimate year will have to attend in person. This date will also be used for face to face meetings with anyone who has received an unsatisfactory outcome from their E-ARCP three weeks earlier. Do NOT get yourself in this group, as you will buy yourself a face to face panel meeting and a permanent blotch on your record. If you are called for a face to face on Friday 30th June there will be no acceptable excuse for not being available to attend. iv. At the E-ARCP you must have a supervisor’s report on your e-portfolio for every post you have been in since the last ARCP. For most people this means a report for your September 2016 to January 2017 job and another report for January 2017 to June 2017. If during this period you have only had one job, then of course one report is sufficient. v. The JRCPTB Gold Guide for Cardiology (link a) gives you a summary of what is needed at each ARCP stage. You should also however take the time to read through the JRCPTB Guidance on WPBAs (second link). This goes through assessments year by year and makes things absolutely clear. There is no excuse for not knowing what you need to have done by the ARCP. i. If you want a job in the deanery in 2018, then you will need to attend a rotation planning meeting in September. These will be similar to previous ARCPs in terms of panel setup, but safe in the knowledge that you have already gained an outcome 1, the focus can be on job planning and training issues. ii. These will take on Friday September 8th 2017 and Tuesday September 12th 2017. Put these dates in the diary now and make sure you are available to be called on either one. iii. If you will be out of programme in September 2017 and you are NOT returning to programme at all in 2018 then you do not have to attend a planning meeting, although you are welcome to have one if you would like the opportunity to sit down and discuss your training progress / needs with the committee. iv. If you do NOT want to have a planning meeting in 2018, because of the unique set of circumstances described in (iii) above, then let please let me know (benedict.wiles@uhs.nhs.uk) and I will give this list of names to the deanery. Otherwise you will be called to attend. i. All Wessex trainees currently get a 4 week block of training that is dedicated to ACHD during their time at Southampton. Unfortunately this often comes relatively late in your training and is a short period of time in which to obtain all the necessary ACHD competencies from the core curriculum. ii. We would therefore like to strongly encourage you to take up the offer of a supernumerary week with the ACHD team at Southampton earlier in training (ST3 and ST4) by using your study leave allocation. This has the unanimous support of the STC and is an excellent opportunity to get early exposure to ACHD and cardiovascular disease in pregnancy, which will supplement your later 4 week block. iv. 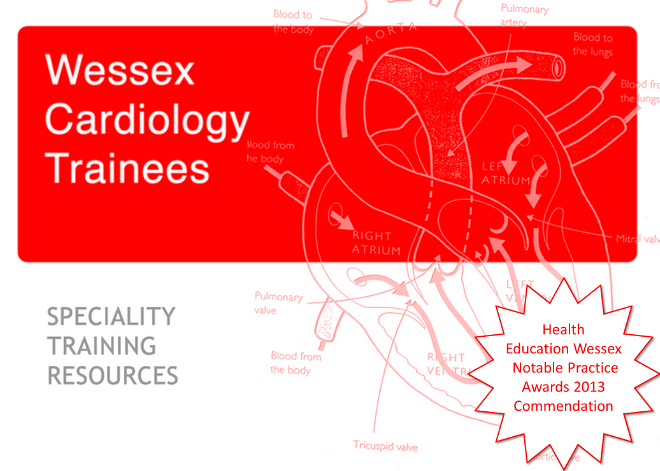 Wessex is also one of only a handful of deaneries that offer a subspecialty (ST6/7) training programme in ACHD. The advert for this training programme is out now. Applicants must already have an NTN in cardiology. v. The JRCPTB provide a checklist for ACHD training and a competency form that needs to be signed off and uploaded to your portfolio (both in the following link). There is a considerable amount to cover to ensure you have reached core competency in ACHD by the end of ST5 so take advantage of the training opportunities you are being offered. 4. Finally I look forward to seeing lots of you for dinner next Tuesday evening (14th March 2017) where Dr John Paisey, our new training programme director, will be available to answer any questions you have about training, the deanery or the ARCP process. It would make sense to have gone through the details in this e-mail before then to make sure you can have all you questions answered. Remember dinner is at The Green Man, Winchester, at 19:30, and is being sponsored by Tina-Marie from Daiichi-Sankyo (makers of Edoxaban). We have 5 spaces left if anyone else would like to join us. Just e-mail Jon Hinton (jwh20485@gmail.com) to get a spot but act quickly as it is first come first served.